We opened our home to friends, family and neighbours for our second annual Christmas drop-in this past weekend. We kept the format and menu the same as last year, why fix what isn't broken? It was a lovely afternoon and we were so happy to welcome everyone for some holiday cheer. 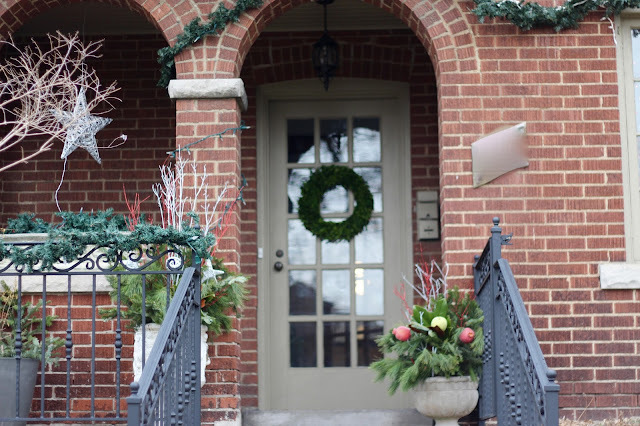 Front door dressed up with holiday arrangements and our new railings. We rented glasses again, both wine glasses and high balls. I set up this kids' area with colouring books, crafts and Christmas books. It was helpful to have these things although my vision of all of the kids sitting quietly doing crafts didn't exactly happen. Playing crokinole while we waited for people to arrive. The board made another appearance later in the afternoon. Thank you to all who attended, and we missed the ones who sent regrets. See you next year! See last year's party here. It was a lovely party! The format and food are keepers...well organized, and lots of fun! Everyone seemed to enjoy the time together.